April 14th is approaching fast for those planning to host or attend a Titanic tribute dinner. While Titanoraks (Titanic fans) pay homage annually, this year is special as it marks the 100th anniversary of the famous sinking of the unsinkable passenger liner off the Canadian coast.Tribute dinners are based on the printed menus for 1st, 2nd and 3rd class (steerage), which survived the disaster. The luxury liner boasted an impressive pantry which fed both passengers and crew: 60 tons of meat and fish products; 50 tons of fruits and vegetables; 5 tons of cereals and 40,000 eggs. There will likely be no shortage of restaurants around the world hosting a dinner inspired by these menus. How about attending an event in Halifax, Hong Kong, or in Houston where a restaurant is offering a lovely meal for $12,000? 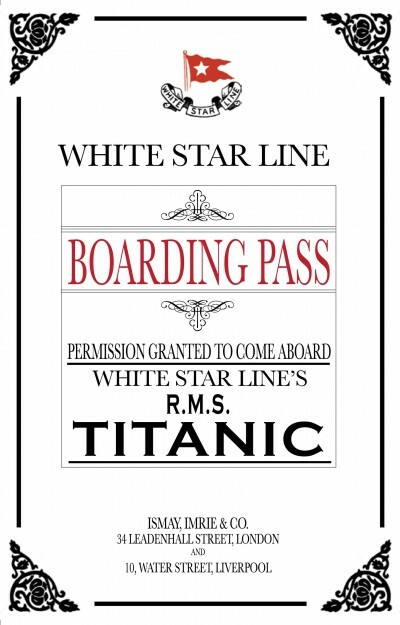 If you are planning to host your own 1st class Titanic dinner, you likely have already sent out your invitations. The one pictured here was created by my talented foodie friend Eva for her friend’s Titanic event. Of the many factors to consider (dress, decor, music, dishes, servers) you should have planned your menu, but might be feeling a little overwhelmed about how to actually cook everything. If you need help with your dinner, or perhaps just wonder how Mrs. Patmore manages to produce an elegant multi-course meal on every episode of Downton Abbey, you may be interested in a suggested game plan to get a sense of how it all comes together. Even with a plan you may be able to better appreciate how chef tempers’ may flair. I was inspired by Last Dinner on the Titanic whose pages not only include menus, but provides a handy Make-Ahead Chart as a guideline to approach a meal of this size. In my adapted version below, I have included hot links to the recipes posted on this blog which I will keep updated. Do not try to prepare this menu by yourself. Think of all the specialized staff who worked in the Titanic kitchens. 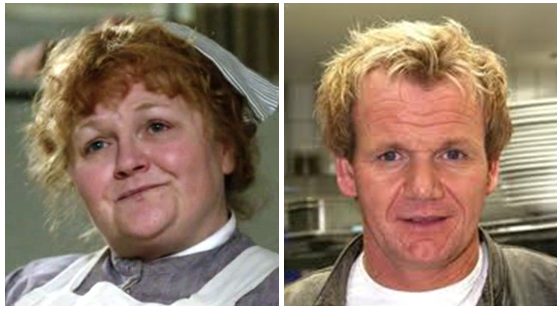 Granted they had to serve 2000 meals a day, but even Mrs. Patmore had Daisy and other kitchen maids to help prepare meals. Enlist at least one sous-chef and a dishwasher to help you through the day and night. Be sure that you take charge and be clear about your expectations from your helpers. Test your recipes ahead of time. This is Easter Weekend so try out one of the entrees (i.e. lamb) on family: they should be far more forgiving than the guests you hope to impress. Do not attempt to make all the entrees; choose one if you are the only cook, or a few favorites if you have other cooks helping you. Dishes like duck or squab might not be a practical choice for picky guests, or if you are trying to keep your budget under control. Unless you have a hotel kitchen, you cannot possibly cook and serve all of the roasts simultaneously. Make sure you have adequate glassware, dishes, and refrigerator and cooking space before you invite guests or go shopping. If you have a small kitchen, see if a neighbor will lend you the use of their kitchen to store and reheat the food. It will help if you invite him/her to your dinner. Consider a pot luck approach, delegating specific dishes to trusted sous-chefs which they prepare in their own homes and bring to finish at your place. Designate a large area to organize your plates, and for plating each course. If you are quick and clever you may be able to wash and re-plate dishes from a previous course. When serving this number of courses, generally cut each portion size by about half. Try not to get too stressed and gain appreciation for those professional cooks and caterers who do this…every day. And remember to pay homage to those crew members who lost their lives in service to the passengers on the ship. Consommé Olga (recipe below): Make consommé base, cover and refrigerate until just before needed. Cream of Barley Soup: make the soup; cover and refrigerate until just before needed. Poached Salmon: make court boullion for salmon. Lamb with Mint Sauce: marinate lamb. Calvados-Glazed Roast Duckling: make applesauce. Peaches in Chartreuse Jelly: make chartreuse jelly. Punch Romaine: crush ice and store in freezer. French Vanilla Ice Cream: make in entirety (or run to the store!). Canapés à L’Amiral: make the shrimp butter and store, well covered, in refrigerator. Cook shrimp for topping the canapes and store in refrigerator. Poached Salmon: if serving the salmon cold, poach salmon, and refrigerate. Creamed carrots: clean and chop carrots. Cover and refrigerate. Roasted Squab: clean and wash watercress. Store in an airtight container lined with paper towels. Asparagus Salad: blanche asparagus, make dressing, and chop the pepper; cover separately and refrigerate. Peaches in Chartruese Jelly: poach peaches and store in poaching liquid. Eclairs: make pastry cream up to point of adding whipped cream. Cool to room temperature, cover tightly and refrigerate. Canapés à L’Amiral: make toast rounds and measure out all remaining ingredients. Filets Mignons Lili: make sauce up to the point of adding the last addition of butter. Refrigerate. Chicken Lyonnaise: prepare coating ingredients. Vegetable Marrow Farci: make entire recipe; keep covered in a cool place until 15 minutes before serving. Calvados-Glazed Roast Duckling: prepare and stuff ducks; keep cold. Measure remaining ingredients. Roast Beef: assemble all ingredients. For your Titanic dinner you won’t be preparing the yorkshires. Château Potatoes: cook potatoes until almost tender. Cover and reserve. Roasted Squab: prepare, wrap with bacon and truss birds; keep cold. Measure out other ingredients. Waldorf Pudding: make pudding, cool and cover loosely. Store in cool place until serving. Minted Green Pea Timbales: prepare, keep in ramekins, cover and refrigerate. Eclairs: make choux buns and fill with pastry cream. Oysters à la Russe: make relish for oysters. Cover and refrigerate. Consummé Olga (recipe below): prepare garnish. Cover and refrigerate. Poached salmon: prepare cucumbers and measure out and organize ingredients for mousseline sauce. Cover and refrigerate. Chicken Lyonnaise: make entire dish up to point of returning to the sauce. Cool and keep covered in refrigerator until 30 minutes before serving. Lamb with Mint Sauce: brown lamb and deglaze pan; measure out sauce ingredients. Minted Green Pea Timbales: reheat ramekins or in microwave before serving. invert and garnish with dollop of your dairy topping and mint. Punch Romaine: assemble all ingredients. Filets Mignon Lili: make potatoes, and cook steaks until three-quarters done. Remove from heat and cover. Consider the timing of your roast(s). You may wish to start them late afternoon and kept warm if completed before you are ready to serve. This is where it pays to have a sous-chef or two in the kitchen doing the work while you entertain your guests. Someone to help with dishes would also be very useful. as the guests arrive, shuck and prepare Oysters Russe and assemble Canapés à L’Amiral. begin the roasts for the fifth course if you haven’t already done so. Poached Salmon: make the moussiline sauce up to 15 minutes before serving and bring cooked fish to room temperature if serving cold. Filet Mignons Lili: reheat and finish sauce and reheat potatoes. finish cooking filets. Chicken Lyonnaise:heat dish over medium heat until heated through and chicken is no longer pink in the centre. Vegetable Marrow Farci: reheat in 350 F oven if you wish to serve warm. Slice into serving sizes. Creamed Carrots: prepare the recipe. while the punch is served, finish the roasted squab and assemble the asparagus salad. serve the salad and drain the poached peaches for the Peaches in Chartreuse Jelly dessert. serve fois gras and celery. have guests help themselves to a fruit olate. In tall narrow pot, gently heat stock until body temperature. Meanwhile, in a large bowl, stir together vegetables, parsley, and meat until well combined; add salt and pepper; fold in egg whites. Whisk heat stock into egg mixture; return to pot and, whisking, bring slowly to boil. When mixture begins to look frothy, stop stirring to allow egg mixture to rise and solidify into a raft. Lower heat to medium-low. Carefully make a vent hole in raft with spoon handle. Simmer consommé gently for 30 minutes. Leaving pot on heat, carefully push raft down with back of ladle; ladle clarified consommé through cheesecloth-lined sieve into clean pot. Heat until very hot. Stir in Port. Garnish: Slice scallops crosswise into 3 pieces, place 3 discs into bottom of each of 6 warmed bowls. 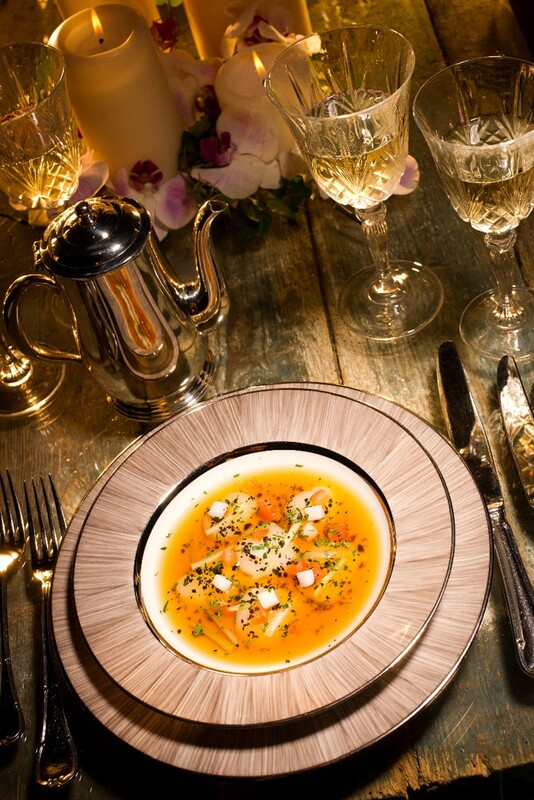 Pour hot consommé over scallops; arrange celeriac (or celery), carrot, and cucumber decoratively in each bowl. Serve immediately. Meanwhile in 2nd Class, passengers were enjoying basically the same soup, but with tapioca instead of scallops garnish. To make garnish, whisk together egg yolks, milk, salt and pepper. Stir in tapioca and let stand 5 minutes. Cook tapioca mixture over medium-high heat for 3 to 5 minutes or until mixture thickens enough to hold its shape. in parsley and spread onto greased baking sheet; chill. Cut tapioca garnish into decorative shapes using aspic cutters or sharp knife. Carefully place in individual bowls of hot or cold consomme. It is still not too late to get your own copy of Last Dinner on the Titanic; click on the image below if you are from the US or select Canada and UK links. Hi Pam, thank you again for the shout out. A note that the white star logo is still under copyright of one of the cruise lines. I like your time-table, but I have another suggestion. I volunteered to make the Canapés à L’Amiral, the fois gras and the peaches in chartreuse and plant to make them well in advance (perhaps even this weekend). With the exception of the peaches in chartreuse, I am confident that the other two will only get better with age, allowing the flavours to meld together. The peaches in chartreuse will require the time to set, but fret not, I will store it in an air tight container so it doesn’t get rubbery! As information, the Titanic Historical Society http://www.titanic1.org/ offers a party kit which I am told contains invitations. I am hoping to get photos of our event, and will blog about them. Cookery is such a personal expression, and execution of any dinner is unique to the tastes, preferences, and time available to the cook and there are many different strategies. You are fortunate to be in the enviable position to assist and be a part of production without having to headline the dinner…all that stress. Would love to share yours, as well as other bloggers Titanic pictures and stories. It surely is all about what works for you; some people don’t have a clue where to start so options are good.